The Burpos The Ministry The Movie Watch FAQ's Booking Who Is Jesus? Heaven is for Real...and you're gonna like it. Our New Book, Now Available In Paperback! Heaven is for Real Ministries was established in May of 2011 due to the overwhelming response to the book “Heaven is for Real” by Todd Burpo. We are dedicated to sharing our story with anyone who wants to hear it for the sole purpose of lifting up the name of Jesus Christ and His church. As we tour around the world bringing the hope of Heaven everywhere we go, we remember that it is only by the grace of Jesus that we are able to do what we do. We live in light of His sacrifice, and we walk in light of his call on our lives. Just as Colton's trip was no accident, we believe that you being on our website is no accident either. Maybe you are here to connect with our correspondence team and ask us questions about Heaven. Maybe you are here because you desperately need someone to pray with you. Or maybe you are interested in finding out more about bringing Todd and Colton to your town. Whatever the case, we want to say welcome, and thanks for stopping by. If our first book was all about the "then" and "there" of Heaven, God is for Real is all about the "here" and "now" of earth. People are tired of pat answers offered up in "churchy" language explaining away their biggest questions. What bothers us most about our faith is often quite real and gritty, and yet we often do not approach these concerns with these types of answers. In God is for Real, Todd charges into these subjects with a fireman's courage, a small-town friend's vulnerability, and a local pastor's compassion. He helps articulate the questions that people have, then gives them relevant biblical wisdom for taking their next steps in faith. Heaven Is for Real is the true story of the four-year old son of a small town Nebraska pastor who during emergency surgery slips from consciousness and enters heaven. He survives and begins talking about being able to look down and see the doctor operating and his dad praying in the waiting room. The family didn't know what to believe but soon the evidence was clear. A shattered leg, kidney stones, and a lump diagnosed as hyperplasia. Times were tough, money was scarce, and the bills and frustrations were piling up.It was into this kind of stressed out life that God sent Todd and Sonja Burpo the interruption of a life-threatening illness and emergency surgery for their almost four-year old son Colton. An interruption that included his unforgettable journey to heaven. Colton Burpo came back from his trip to heaven with a very important message: Jesus really, really loves children. In an effort to reach even more families with this eternally significant story, this runaway bestseller is now told from Colton's perspective - from kid to kids! 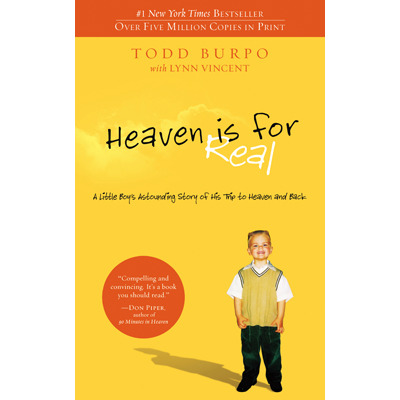 Children will receive the same comfort and assurance that so many adults have received from the original book, Heaven is for Real. Colton Burpo came back from his trip to heaven with a very important message: Jesus really, really loves children. In an effort to reach even more families with this eternally significant story, Heaven Is For Real is now simplified and told in a board book format for little ones. Young children will receive the same comfort and assurance that so many older kids have received from the picture book.